You can add or remove sign-up payment methods in the Advanced Panel of the settings section. 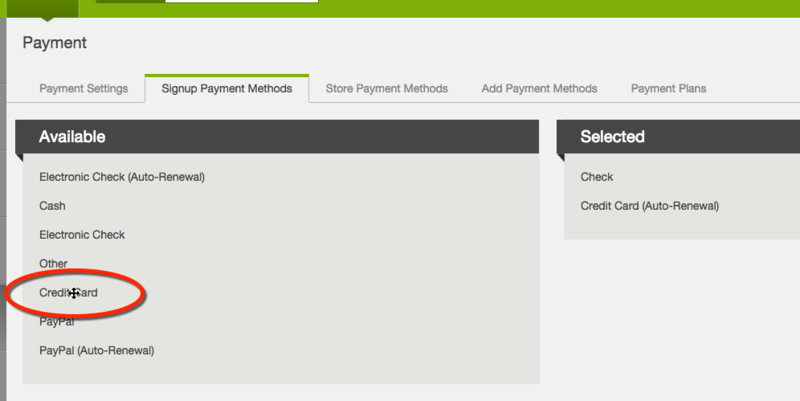 Once you're in the payment screen go to the Signup Methods tab and select "Edit". In the "Available" section on the left hover over the payment method you would like to add. When it turns into a cross drag the method over to the selected section. Repeat as necessary. To remove a payment, drag it from "Selected" to "Available". To add a payment, drag it from "Available" to "Selected". Push save and your payment methods will be updated.